Since the feedback forum is locked, I'm posting about this here. The primary question is this: what's the point of having both maces and heavy clubs? They do the same damage and neither of them has special qualities of any sort. As far as I can see, getting a mace instead of a heavy club involves paying twice as much for a weapon with one pound less of weight--which is basically meaningless with the SWADE encumbrance rules. I've always thought we needed a Str+d6 blunt weapon (and btw, I love that swords and axes are now listed by weapon type, then size), but I really don't think we need two identical ones with different prices. Agreed. The mace would probably benefit from some level of AP as that's what it was designed to do—then again, that basically makes it a variant of the warhammer, but that's what I always did anyways. Honestly, the best solution I could see is to make mace the default Str+d6 blunt weapon and move warhammer into the Str+d8 slot (which currently has nothing for blunt weapons), then get rid of heavy club entirely or add AP 1 to the mace to justify the higher cost. Str+d8 warhammer is not very realistic, historically speaking. A warhammer wasn't a big, heavy lump of metal like many fantasy sources portray it; it more resembled a modern masonry hammer. It's intend was to damage armor, denting it or folding it over to make it less effective for the user. Same can be said for the mace, so I would be inclined to treat warhammer/mace as Trappings of the same weapon. Heavy Club just sounds like it would be large and heavy. Maybe a cheap, two-handed weapon dealing d8 damage? To be fair SW generally uses that other game's conventions for for weapons anyway, so realism or historical accuracy aren't the priority. You can add Mauls to that as well, It needs to unwieldy but the weight also crushes through armour. I'm going to house rule Mace and Maul do AP1, and Mauls get -1 to Parry on top of it. -1 Parry is a lot more severe than AP 1 is beneficial. Even with the +2 damage when Breaking Objects, I'm not sure that's balanced. Is it? Hmm. Thing is, it's as awkward as a 'great axe', so I can't remove -1 Parry (Again, MY house rule) so what would you suggest? Not sure that it helps, but one thing to understand about Maces vs Clubs is that maces, being made of quite a bit of metal, tend to be alot more resistant to damage. So if someone tries to disarm a mace and strikes the weapon, it'll be a lot harder to break than your baseball bat. I like the idea of giving certain weapons higher (or lower) Toughness as a bit of a balancing factor. Wooden staves shouldn't be just as hard to break as a blade made of spring steel (which is designed to resist breakage). Though made of metal, the hafts of maces were rarely, if ever, made of solid steel. A small dent would quickly compound to a bent weapon with each successive strike. I'm not sure if I'd wager a mace to be harder to break than a baseball bat. Maybe about equal. The haft of of a mid- to late-medieval (and certainly into the Renaissance) mace is made from whatever the head is, because it's the same piece of metal. Since we’re all talking about maces and clubs. What the heck does “A sign of low status or thuggery” mean? Does that cause a noble or rich character to lose favor in the eyes of their peers? Why only those two weapons? I guess a staff has the legitimate excuse to be carried. Since it can be used for things besides bashing. The Notes column on the weapon table does seem like a bit of a weird place to put flavor text. I assumed Shane was just working late and tired. :-) I wouldn't read too much into it. This doesn't bother me, tbh. They had a bit more space on that page, so they filled it with a few more weapons for flavor. Jounichi Hand axes are also listed as ranged weapons with the same weight, damage, and price. Quite a difference from short swords. Also, the Breaking Objects rules care about damage types, as do some monster special abilities. It's a rarely used feature but is noted when it matters. ValhallaGH Those are throwing axes, which do have a different weight listed. Some settings have overlap, but the core rules presently do not. It seems that the big advantage of maces is they can do nonlethal damage without the -1 penalty, assuming you treat them as blunt weapons and don't give them an edge because they're flanged. Jounichi They do? Crap, they do!? One of the many non-sensical minor changes in v4.0. I swear, 4.0 regressed so many of the good changes made in previous versions. Did they just update 1.0 with the changes meant for 3.0? Or were all these minor changes intentional, despite making the game worse? 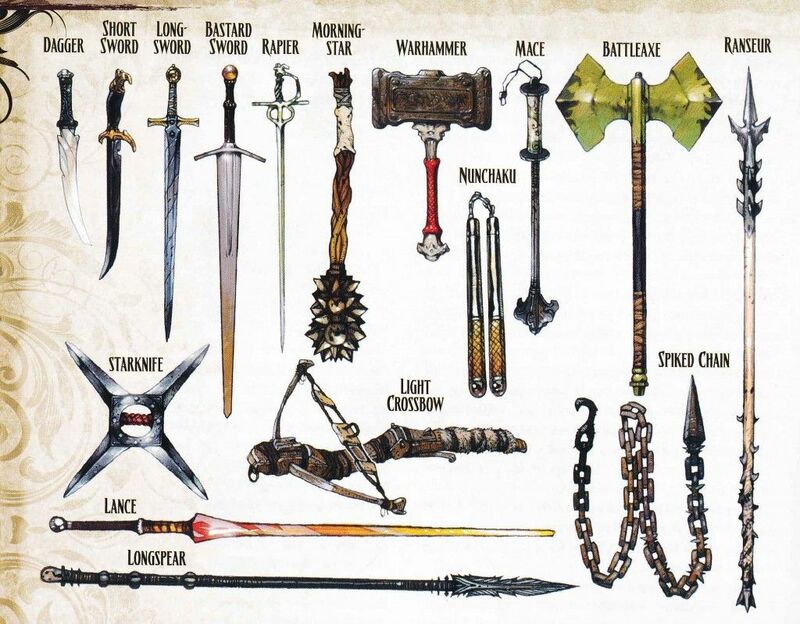 Or you could just note "includes maces" under heavy clubs, like you do with cavalry sabers for short swords. Then you have the problem of the basic weapon with a Hardness around 8-9 with an alternate form at 10. You also have issues with the base weapon being relatively cheap (it's a stout chunk of wood), while the alternate form is a forged rod of iron or steel. And then PEG is baking in some default assumptions. They're not the same thing. Given the weight differential, there's even an argument that a heavy club is a much larger item and should have the Two Hands quality. Then don't fold it into the heavy club, fold it into the warhammer. Again, the purpose of the mace was to deal with armored opponents, so AP 1 is perfect for that kind of thing. Outside of that, any assumptions on Hardness is house rules if it's not on the table or listed in a weapon's description. A lot of people who pick up the book won't be able to make that distinction. Maybe some additional content or fantasy companion could include an image much like this one: https://i.pinimg.com/originals/e4/57...3b07e61fc2.jpg for flavor and variety. Maybe, but I'd really prefer something accurate. That warhammer is a pure comedy, that ranseur is a greater danger to the wielder than to foes, the lance is blunt, the battle axe is laughable, and it goes on. So, really my only problem is the weights. Then again, always felt SW put things on the heavy size. No way someone could swing a 5lb club, especially one-handed, for more than a couple swings without throwing your back out. Think they all should come down a lb or two, and heavy clubs be 2 handed. That's just me. With the new Encumbrance and Min Str rules, weights matter a lot less. So while I can see your point, it's even easier to ignore. True, but I know some GMs will enforce encumbrance. My GM specifically said he WILL force encumbrance, regardless of suggestions to the otherwise.